a thread from the edge: A Closer Look at "Feeling Blue"
2. 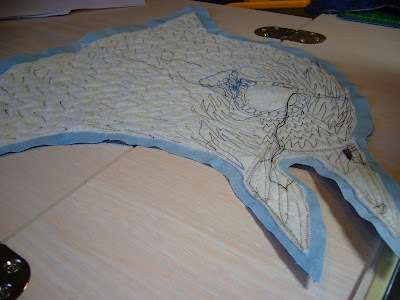 Fabric painting with Seta paint (over dyed fabric) - I prefer to paint dyed fabric - it gives a much richer color. 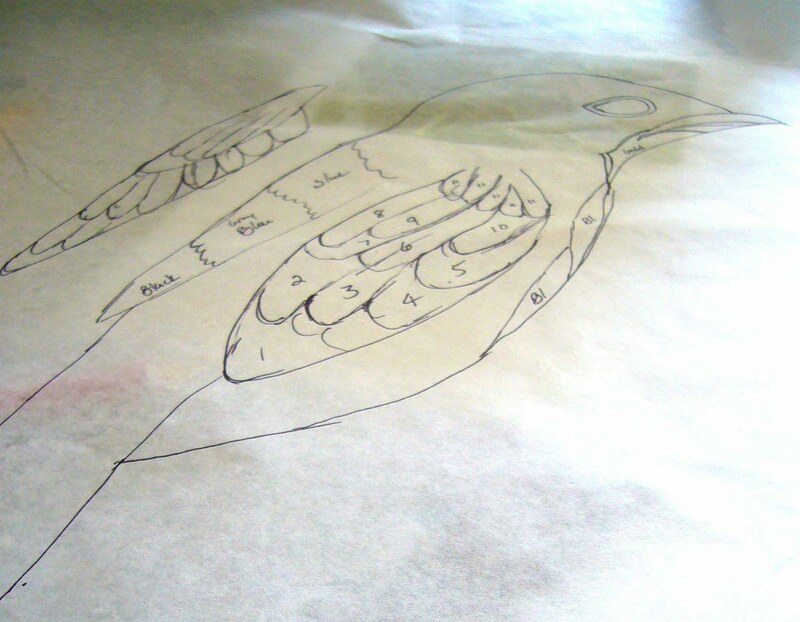 I want to use this post to talk specifically about the creation of the birds. 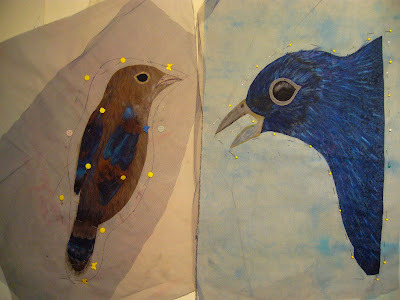 I made the birds separately and then appliqued them to the quilt. It all starts with the drawing. I trace the bird onto freezer paper and then draw in my fabric sections. 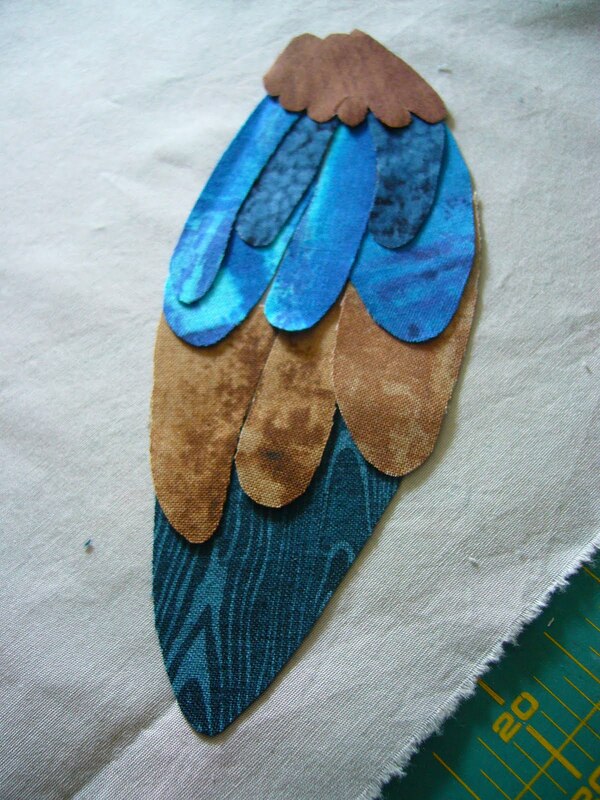 I cut out the paper pieces and use them to cut out my fabric. It's starting to look like a wing now - there is no fusible used in this method - I do not like fusible. 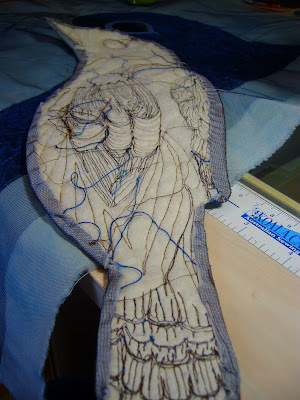 Fast forward - I continue to build the birds using this process, organizing all components on a piece of foundation fabric. No fusible or glue here - keep the windows closed and the fans off or you'll be picking up pieces off of the floor. 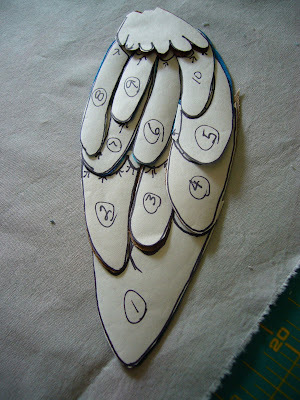 Here are the birds all set to quilt. 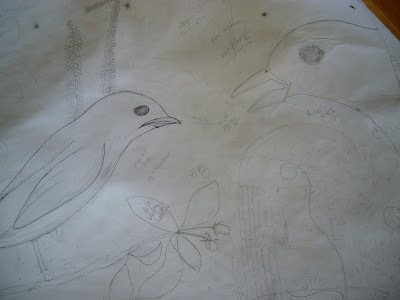 I have added highlights using my water based oil pastels - another class. I've added a layer of batting under the foundation fabric. I use tulle as an overlay for the birds - it holds the pieces in place while I add quilting, and it dulls the edges of the fabric transitions - I love to use tulle. 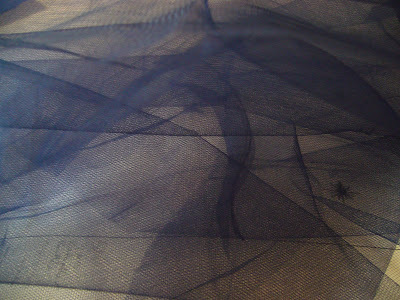 The birds received an over lay of a deep blue tulle - actually the small bird has a few different layers of tulle. 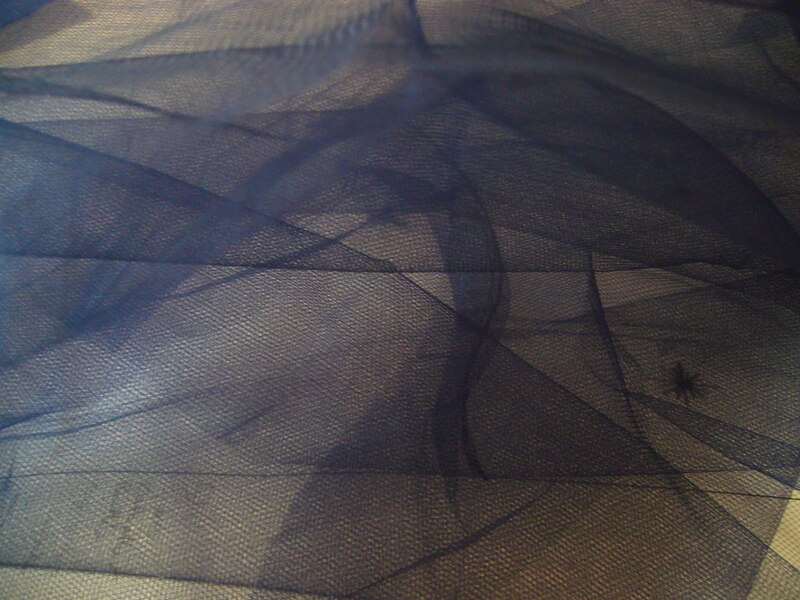 I keep many different colors of tulle on hand to audition what works best. 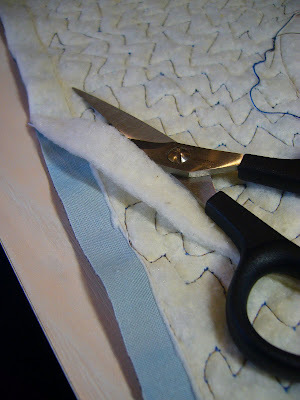 Once the tulle is anchored down with pins I start quilting - you need to be very careful not to snag a needle or pin on the tulle - it rips very easily. 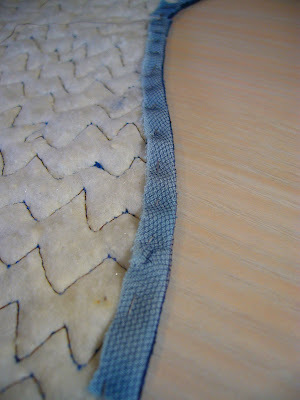 I use free motion quilting to anchor the fabric pieces and add more color and texture in a variety of thread colors. Here's papa bird all quilted and cut out leaving a 1/2 inch border. 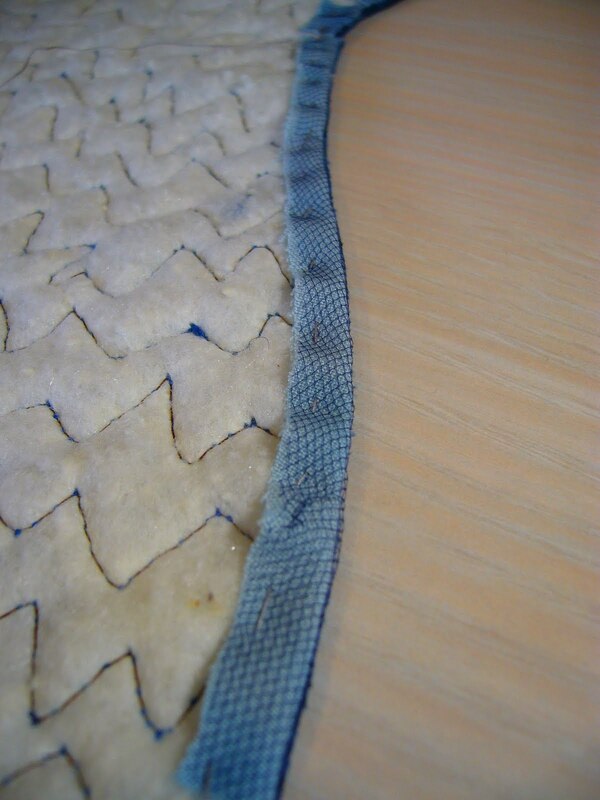 I remove the 1/2 inch of batting in the border area, cutting very carefully. I then hand baster the netting and foundation layer to the back - did I mention this was labor intense??? Here's baby bird all finished and ready to be appliqued to the quilt. 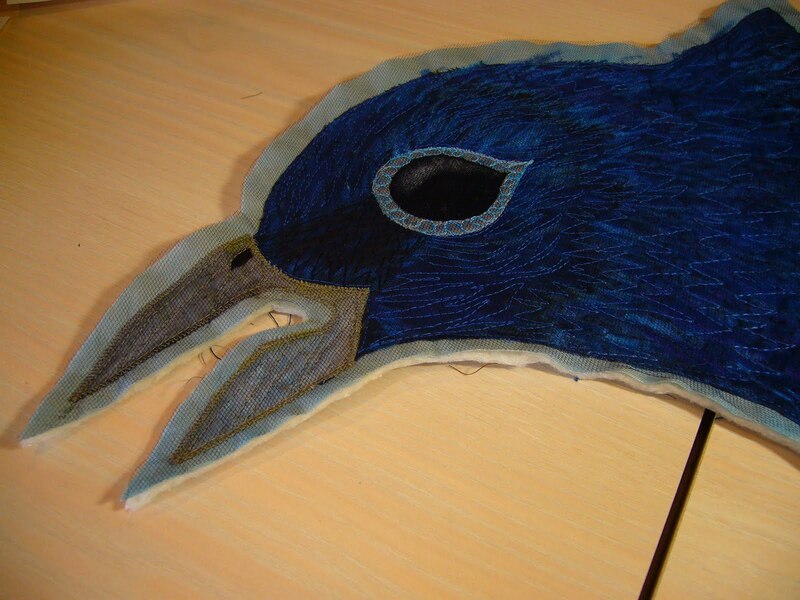 The birds were one of the very last items to be added to the quilt - I machine appliqued them using a narrow zig-zag stitch and matching thread. Whew! 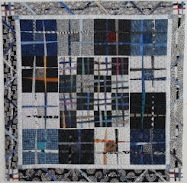 Next post - the frame - fasten your seat belt - talk about labor intense!